Want a countdown widget? Grab it over at Safari Poet! For some reason I thought this one was out already and I was just behind reading it, lol. Definitely excited for this one though. I really should go Pre-Order my copy now that I'm thinking of it. Great choice! 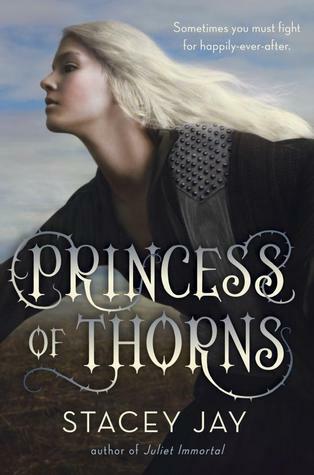 I haven't read anything by Stacey Jay, but Princess of Thorns sounds really amazing. It reminds be little of Defy by Sara B. Larson, but it also has it's own kind of uniqueness, so I really hope we both end up liking it! That cover is pretty hideous but I do like retellings. I'll have to check this one out when it's released. I haven't read/heard of many Sleeping Beauty retellings so that's cool! This one does look good. I haven't read Jay's Juliet Immortal series, but I did read Of Beast and Beauty which was pretty interesting, so I'm looking forward to what she does with this story. And yes, the cover is a tad underwhelming... and awkward. Great pick! I haven't read her Romeo and Juliet retellings but I have read Of Beast and Beauty and loved it! I don't really like the cover either :/ Definitely excited for this book though. I've read a Stacey Jay book before. It think that was Juliet Immortal. I've liked it just fine. I don't know about this one but I always like a good retelling. I love fairy tales retold so I may have to check this one out. I liked Juliet, Immortal. This sounds like fun! You had me at Fairy! Princess disguised as a boy... sounds like fun!